LIMITED TRUCK CAMPER WARRANTY FOR TRUCK CAMPERS MANUFACTURED BY LANCE CAMPER MFG. CORP.
Lance warrants to the original purchaser ("Owner") of this truck camper ("Camper") to be free of defects in materials and workmanship and for structural integrity, under normal use, with reasonable care and maintenance, for one (1) year from the date of purchase (the "Warranty Period"), subject to the exclusions given below. 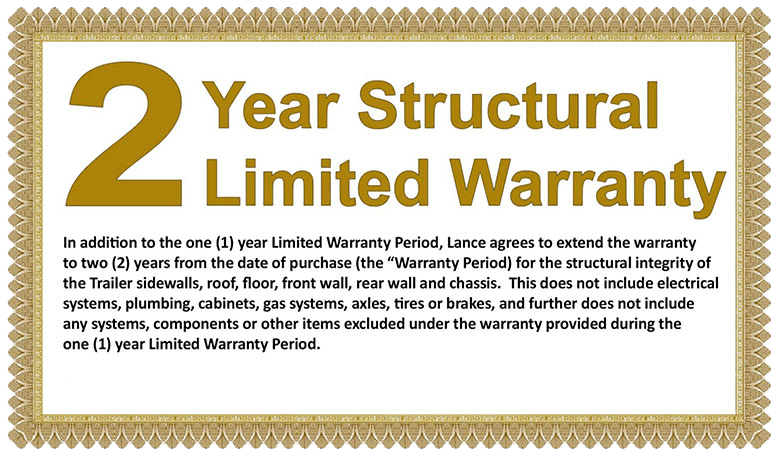 Within the Warranty Period, Lance is obligated to repair or replace any part covered by this warranty proven defective. In the event of such an occurrence, the Owner should contact the selling dealer for a service appointment. If it is not possible to return to the selling dealer, call the Lance factory service department, and they will provide you with the location of the nearest authorized dealer or repair facility. The cost of transporting the Camper to the dealer or service center shall be incurred and paid for by the Owner. This is the only warranty given with the purchase of the Camper other than express or implied warranties given by the component manufacturers. Any warranties implied by law are limited to the Warranty Period. Any other warranty, express or implied, not provided for in this Limited Warranty is waived by the Owner. The purchaser must notify Lance Campers or a Lance authorized dealer of any defect promptly upon discovery. Warranty repairs by a non-Lance dealer or service center must be approved by the Lance Factory Service Department prior to any work being started. The scope of this warranty is expressly limited to only items actually constructed by Lance. Lance therefore makes no warranty with respect to component parts constructed or assembled by other manufacturers, including, but not limited to, the Liquid Propane Gas appliances, electrical appliances, heaters, refrigerators, plumbing fixtures, light fixtures, lights, entrance door and windows. Such component parts may be warranted by their respective manufacturers, and copies of such warranties are included with the Camper. This warranty does not cover damage caused by or related to (1) normal wear and tear, (2) accidents, abuse, misuse or negligence, (3) failure to comply with instructions contained in the Owner's Manual, (4) any alteration or modification of the Camper, or (5) environmental conditions, including, but not limited to, road salt, hail, or windstorm. Nor does this warranty apply to parts made out of cloth, leather, wood, paint, or chrome, which have been affected by airborne fallout, including, but not limited to, chemicals and tree sap. No payment or other compensation will be made for incidental expenses, including, but not limited to, towing, telephone, transportation, lodging, travel, gasoline, loss of pay or indirect or consequential damage including, but not limited to, loss of use of the Camper, inconvenience, damage or injury to person or property, or loss of revenue, which might be paid, incurred or sustained by reason of manufacturer's defect covered by this warranty. Lance is not responsible to any purchaser of the Camper for any undertaking, representation or warranty made by dealers during the course of selling the Camper beyond those herein expressed. As the manufacturer of the Camper that you purchased, Lance does not know the purpose you have in mind for your truck and camper, nor does Lance know the Gross Vehicle Weight Rating ("GVWR") of your truck. Therefore, Lance makes no warranties or representations, express or implied, as to the performance of your truck with the Camper or whether the match‑up of your truck and Camper exceeds the GVWR as specified by your truck's manufacturer. Specifically, there is no express or implied warranty of merchantability or of fitness for the particular match of your truck to any particular camper. This Limited Warranty is intended to comply with the requirements of both State and Federal laws. Any part of this Limited Warranty in conflict with any law shall be ineffective to the extent of any such conflict. This warranty gives you specific legal rights, and you may also have other rights, which may vary from state to state. RONALD MARK ASSOCIATES INC. ("RMA") offers this Limited Warranty ("Limited Warranty") solely to the original retail purchaser, ("Purchaser") of the RMA XTRM PLY® thermoplastic roof membrane, ("Roof Membrane") for use in Recreational Vehicles ("RV"). RMA warrants, subject to the provisions set forth herein, to the Purchaser, for a period of fifteen (15) years from the date of original purchase of the Roof Membrane that the Roof Membrane shall be free from defects in materials which cause premature deterioration to the point of failure due to weathering if properly maintained. In order for this Limited Warranty to be available to the Purchaser, Purchaser, must, within thirty (30) days after the discovery of any deterioration in the Roof Membrane, which Purchaser believes are caused by defects in the Roof Membrane, provide RMA with written notice of any such deterioration, by certified mail to: Ronald Mark Associates, PO Box 776, Hillside NJ 07205. RMA must pre-approve all warranty claims ("Approved Claim") before any repairs, credits or Roof Membrane replacements can be performed. The Purchaser must collect, maintain, and provide to RMA the following information which will be required on all warranty claims: model and vin number of RV; date of production; proof of purchase date (bill of sale); location of RV; owner name, phone number, and email; color photos of issue; detailed description of issue; and repair estimate. A sample of the defective roof membrane area must be forwarded to LaSalle Bristol for warranty claims to be considered and approved. Within thirty (30) days after written notice of the purported defect has been received by RMA its authorized representative will investigate the claim and make its determination on warranty coverage. This Limited Warranty shall not be applicable and shall be null and void if, in the sole judgment of RMA Purchaser fails to strictly comply with any of the terms and conditions of this Limited Warranty under the Exclusions from Limited Warranty Coverage paragraph below. RMA does not install the Roof membrane and is not responsible for any problems relating directly or indirectly from the installation of the Roof Membrane. In the event that upon inspection by RMA or their designee it is determined that the Roof Membrane indicates premature deterioration to the point of failure as a direct result of weathering, RMA's sole liability and the Purchaser's sole and exclusive remedy shall be limited, at RMA's option, to provide material for the replacement of the defective portion of the Roof Membrane or a credit to the Purchaser towards the purchase of new Roof Membrane equal to the estimated material cost to repair the defective Roof Membrane. RMA will replace the defective material for fifteen (15) years from the original purchase date. In no event shall the remedy of the Purchaser under this Limited Warranty exceed the material cost of replacing the defective Roof Membrane with a new Roof Membrane. replacing any other property which is damaged because of a defect in the Roof Membrane as well as other consequential damages. The extent of this Limited Warranty remedy provided to Purchaser hereunder shall not exceed the material cost of replacing the defective or allegedly defective Roof Membrane with a new Roof Membrane. This Limited Warranty applies only to the condition of the Roof Membrane and does not include improper installation, sealant, adhesives, flashings or other similar accessories contained in or upon the roofing system. Purchaser should inspect the Roof Membrane at the time of delivery of the Product subsequent to Purchaser's purchase thereof. Purchaser is responsible for the normal maintenance and care of the Roof Membrane. Purchaser should read and follow all care and maintenance instructions for the cleaning and maintenance of the Roof Membrane. Exclusions from Limited Warranty Coverage. Purchaser's failure to exercise reasonable care in the care and maintenance of the Roof Membrane; this includes inspection of selant and caulk on a 6 month basis. Natural disasters such as acts of God, or any defects or damages caused by environmental conditions and contamination caused by pollutants. Normal wear and tear of the roof or exposure to fire or extreme heat. This warranty does not cover fading or discoloration due to wear and weathering. Damages as the result of acts of terrorism. No person has the authority to enlarge, amend or modify in any manner, or to make any changes to this Limited Warranty. The warranty registration card must be returned to LaSalle Bristol within 30 days from the date of purchase of the Roof Membrane in order for the Purchaser to be entitled to warranty coverage. No Limited Warranty claim shall be valid or recognized by RMA unless Purchaser notifies RMA, in writing, within 30 days of discovery of a purported deterioration in the Roof Membrane, which Purchaser has a good faith belief was caused directly by defects in the Roof Membrane. part of RMA and is the sole and exclusive remedy for defects relating to the Roof Membrane. Implied warranties, including the implied warranty of merchantability or fitness for any particular purpose if any, given by any applicable law, shall be limited to and not extend beyond the duration of the written Limited Warranty periods set forth herein. RMA shall not be liable to Purchaser for any consequential, incidental, exemplary, punitive, special or indirect damages and shall not be liable for any damages which are based upon negligence, breach of warranty or strict liability except as may be provided for herein. Some states do not allow the exclusion or limitation of incidental or consequential damages so the above limitation or exclusion may not apply. No waiver of any breach of this Agreement shall be construed to constitute a waiver of any subsequent breach of a similar nature. No warranties or representations shall be deemed to have been made by RMA except as expressly hereinabove set forth. The terms and conditions of the Limited Warranty shall be governed by and construed in accordance with the laws of the State of Jersey, excluding the choice of law provisions thereof. Any dispute arising out of or relating to this Limited Warranty shall be brought exclusively in the state or federal courts of New Jersey, and Purchaser and RMA consent to personal jurisdiction and venue in such courts. If any provision of this Limited Warranty is found by a court of competent jurisdiction to be unenforceable for any reason, the remainder of this Limited Warranty shall continue in full force and effect to the maximum extent permitted by law. (6) months after the discovery of any deterioration in the Roof Membrane. The provisions of this Limited Warranty shall apply to the fullest extent permitted by law. If any part of this Limited Warranty shall be determined to be invalid or unenforceable by a court of competent jurisdiction or by any other legally constituted body having jurisdiction to make such determination, the remainder of this Limited Warranty shall remain in full force and effect. This Limited Warranty shall not be deemed to give any right or remedy to any third party whatsoever unless that right or remedy is specifically granted by RMA in writing to that third party. Notwithstanding any other provision hereof, in no event shall the total liability of the RMA under this Limited Warranty (including, without limitation, for breach of warranty or breach of contract) exceed the Purchaser's original purchase cost of the Roof Membrane. LIMITED TRAILER WARRANTY FOR TRAILERS MANUFACTURED BY LANCE CAMPER MFG. CORP.
Lance warrants to the original end user purchaser ("Owner") of this Trailer ("Trailer") to be free of defects in materials and workmanship and for structural integrity, under normal use, with reasonable care and maintenance, for one (1) year from the date of purchase (the "Warranty Period"), subject to the exclusions given below. 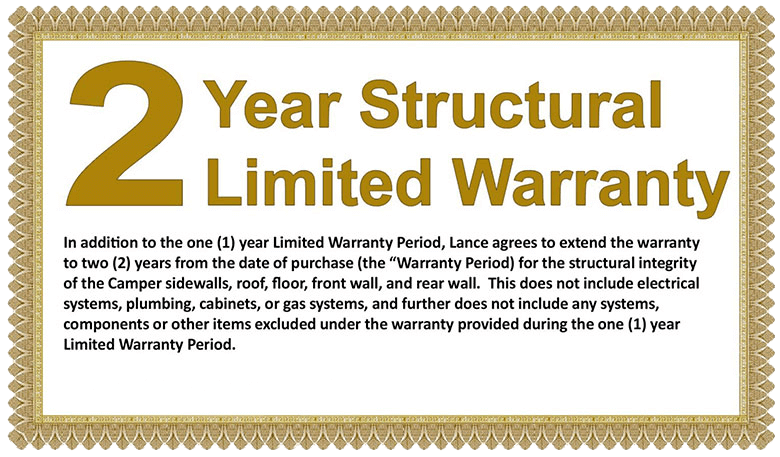 Within the Warranty Period, Lance is obligated to repair or replace any part covered by this warranty proven defective. In the event of such an occurrence, the Owner should contact the selling dealer for a service appointment. If it is not possible to return to the selling dealer, call the Lance Factory Service Department, and they will provide you with the location of the nearest authorized dealer or repair facility. The cost of transporting the Trailer to the dealer or service center shall be incurred and paid for by the Owner. This is the only warranty given with the purchase of the Trailer other than express or implied warranties given by the component manufacturers. Any warranties implied by law are limited to the Warranty Period. Any other warranty, express or implied, not provided for in this Limited Warranty is waived by the Owner, to the extent allowed by law. The purchaser must notify Lance or a Lance authorized dealer of any defect promptly upon discovery. Warranty repairs by a non-Lance dealer or service center must be approved by the Lance Factory Service Department prior to any work being started. The scope of this warranty is expressly limited to only items actually constructed by Lance. Lance therefore makes no warranty with respect to component parts constructed or assembled by other manufacturers, including, but not limited to, all electrical devices (TV, sound systems, DVD player, antennas, batteries, etc. ), the propane appliances, electrical appliances, heaters, refrigerators, plumbing fixtures, light fixtures, lights, entrance door and windows. Such component parts may be warranted by their respective manufacturers, and copies of such warranties are included with the Trailer. This warranty does not cover damage caused by or related to (1) normal wear and tear, (2) accidents, abuse, misuse or negligence, (3) failure to comply with instructions contained in the Owner’s Manual, (4) any alteration or modification of the Trailer, or (5) environmental conditions, including, but not limited to, road salt, hail, or windstorm. Nor does this warranty apply to parts made out of cloth, leather, wood, paint, or chrome, which have been affected by airborne fallout, including, but not limited to, chemicals and tree sap. No payment or other compensation will be made for incidental expenses, including, but not limited to, towing, telephone, transportation, lodging, travel, gasoline, loss of pay or indirect or consequential damage including, but not limited to, loss of use of the Trailer, inconvenience, damage or injury to person or property, or loss of revenue, which might be paid, incurred or sustained by reason of manufacturer’s defect covered by this warranty. Lance does not warranty equipment or accessories installed at any dealership or other place of business, or by any other party. As the manufacturer of the Trailer that you purchased, Lance does not know the purpose you have in mind for your tow vehicle and Trailer, nor does Lance know the Gross Vehicle Weight Rating (“GVWR”) of your tow vehicle. Therefore, Lance makes no warranties or representations, express or implied, as to the performance of your tow vehicle with the Trailer or whether the match up of your tow vehicle and Trailer exceeds the GVWR as specified by your tow vehicle’s manufacturer. Specifically, there is no express or implied warranty of merchantability or of fitness for the particular match of your tow vehicle to any particular Trailer. Both the Truck Camper and Travel Trailer warranties were accurate at the time of the publication of this website. For a current warranty statement, contact your local dealer or Lance Camper.